Our Blacklister tonight is Lady Luck, a person or persons Red thought might be an urban legend but apparently isn’t. 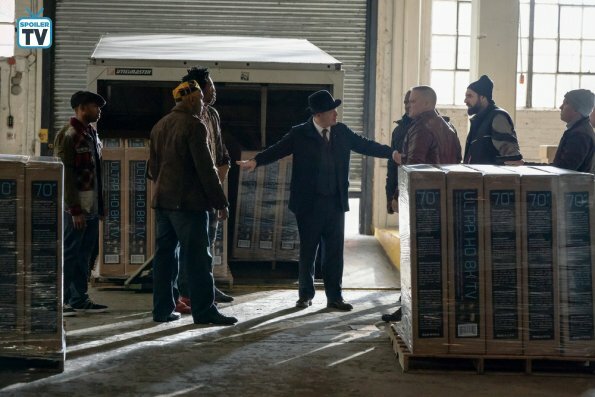 Henry, a man who works for Red from time to time didn’t show up to take care of an incoming shipment of Red’s and later tells Red he’s been visited by “an angel”. This angel will pay off all of Henry’s (substantial) gambling debts if he’s willing to “bet on himself”, whatever that means. Red calls Liz and tells her about the legend that isn’t, then drops the fact that Henry occasionally works for the Third Estate before jetting off to look some people in the eye. 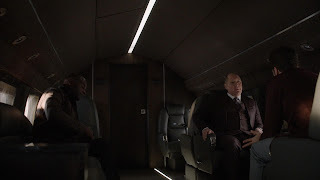 Red loads up Smoky and Dembe and takes the jet to spend time with a couple of his associates. Since Red was in prison a number of them have gone into business for themselves, some co-opting the schemes Red had going himself. Many had profited, so any one of them could have turned him in to the police. If he can look them in the eye, he’ll know whether or not a given criminal is the culprit. Yeah, he’s still on that, and Dembe looks less than thrilled. He knows Liz is the one who turned Red in but continues to keep her secret. The first man Red visits gets off easy; he only has to turn over 15% of his profits. Red looks into his eyes and knows that he did not turn him in. The second guy? Not so much. Sure, he took advantage of a number of Red’s associates to expand and rapidly grow his business, but he didn’t turn Red in. But in this case, it doesn’t matter. The criminal in question has been running meth. He lies about what he was doing initially, but Red knows all and he finds meth an unforgivable product. So, he shoots the guy dead. Back in DC, the gang has figured out who Lady Luck is and what she’s asking in return for clearing all of a gambler’s debts. You just need to kill whoever Lady Luck tells you to. You can do it however you like, but once the death has been confirmed then your debt is erased. Henry killed a woman and botched the job; she’s dead, but what was supposed to look like a robbery…doesn’t. It’s easy to trace him, and when Ressler and Liz visit Henry's wife and explain the situation, so when Henry calls her she asks him to meet her at their favorite park, then gives the information to the FBI so they can arrest him. While a debt-free Henry is in the park talking to his wife, however, another man approaches Henry and tries to shoot him. You see, the person that you are being asked to kill is the person who took advantage of Lady Luck’s offer before you. So, the man who tries to kill Henry is the one who will in turn be the next victim. And I don’t think that Ned, the idiot who just wandered into the park and took a shot at Henry in plain sight, will be clearing any debts anytime soon. A visit to Agatha’s daughter Moira causes confusion: she tells Liz and Ressler her mother gave away all of the money and that her father died in the car crash. But Aram finds that a disability check has been mailed to Lou for years, and the team rushes to the address of the cabin cabin where he and Agatha live. They are “luckily” just in time to arrest Agatha, who had a couple piles of cash on her and was ready to go into hiding. And what was Lou doing? Why, he was in a gigantic iron lung, the result of his accident. He’s spent years in it, unable to speak or move, listening to Agatha telling him how she’s having to save the innocent bystanders, as it were, of losers like him. She then tries to kill Lou by short-circuiting his iron lung by some kind of hookup involving tossing a toaster in to a sink full of water. At the Post Office, Moira is talking to her mother and trying to understand what she’s done and why. In the end, though, Agatha will still be going to jail, and Moira joins her father to talk to him about how she will be taking care of him now. Oh, and the millions of dollars that her family won? It goes to her now, and Moira has decided that she’s going to pick up where Mommy left off. Cue scary music. A side note this week's tale is Ressler’s never ending search for Katerina Rostova. A friend from the CIA who Ressler has been nagging the hell out of manages to get him the manifest from the ferry where Kat was last seen. There is only one person who isn’t accounted for, but she’s 81 years old. Hummm…way too old for Katerina, but maybe it could be her mother? Lizzie may have a Gamma!!! And on Friday I hope we’ll find out more. P.S. - Henry is also at the Post Office, his leg untreated (Ned did get one kind of decent shot in at the park). He is beyond thrilled to be alive and will tell anyone anything they want, including whatever he knows about the Third Estate. P.P.S. - I am going to be mourning Agatha for a long time, possibly until the series ends. And maybe beyond. I loved her. Loved her. Red could use her, he really could. She has just enough snark and sass that he could just drop her into his organization and she's fit right in. Oh, can you see her as a nursemaid for Red while he's ill? Break her out of jail, Red!! !